The AR Blue Clean AR142-P is a one-of-its kind cold water pressure washer with a universal electric motor, designed with the intent of providing several advantages over gasoline-operated washers as well as other electric pressure washers in the market. Wheeled, sleek and compact (with main body dimensions being 11.2 x 9.8 x 19.1 inches), this pressure washer weighs only 12 pounds, making it extremely easy to carry it around for multiple cleaning purposes. Its 20-feet high pressure hose and almost equally long power cord enable high area coverage while cleaning. Having experienced the serious issue of tugging along bulky washers in the past, we’ve definitely been delighted with this model’s hassle-free portability! A special word of mention for its Triplex Power Pump with Axial Wobble Plates (1600 PSI, 1.58 GPM and 1.2 HP), which is incredibly powerful, considering that this is definitely not a heavy-duty industrial type model! When my wife and I first began to assemble the various components of the AR Blue Clean AR142-P, there was a little confusion since the manual wasn’t very clear in certain areas. But once we did manage, it was all smooth sailing! I remember how we painstakingly used to attach and then remove the various attachments and cleaning heads in our previous bulky, gasoline washer. This model on the other hand, does not have any cumbersome attachments, and you just need to twist the end to adjust the spray. The floor cleaning attachment is actually a circular disk with 2 controlled water jets, and of course, you can alter the setting to pencil and fan jet. The safety lock is yet another great feature, which prevents the Total Stop/Start trigger from getting accidentally switched on, on its own! Once again, a great piece of equipment in terms of being almost noise-free. You just hear a low humming, and I can effectively bid good riddance to the chaotically noisy gasoline-pump washer that we owned earlier! 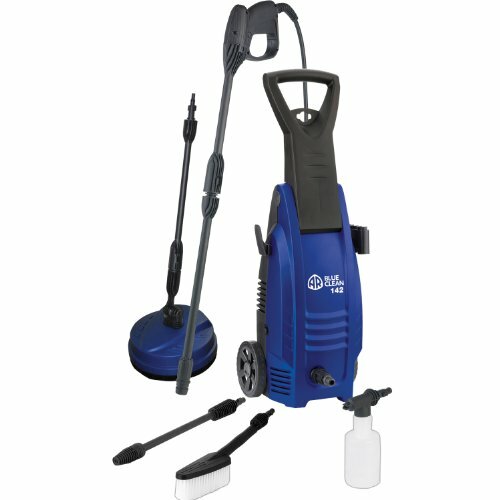 The AR Blue Clean AR142-P truly provides you with the power of a robust, industrial washer with the price, user-friendly features and portability of a domestic cold pressure washer! The 120 Volt, 60 Hertz Universal Electric Motor and Triplex Power Pump with Axial Wobble Plate generate a PSI of 1600 with 1.58 GPM and 1.2 HP. If you’re not very technically sound, I’d just like to tell you that this electric washer is powerful enough to clean all the debris and dirt off your car or deck, without ruining the paint or scratching anything! good, you can conveniently cordon off large area for cleaning. Also, the large patio brush, turbo nozzle lance, fixed brush and adjustable spray head with special fan jet settings, greatly add on to the versatility of the device, making it ideal for vinyl and wood sidings, concrete floors, brick surfaces, metallic and stone surfaces and so on. The only major hassle I’ve faced so far is that I need to refill the cleaning solution from time to time, considering that the foaming bottle can accommodate only 12 oz at once! The AR Blue Clean AR142-P electric cold pressure washer comes with a full-fledged 1-year warranty. We’ve been using this model for about 2 years now, and it does appear to be working quite well. However, once I stored it in the garage closet and the power hose got entangled with the power cord, and I had a really tough time separating them! So I really wish there was some provision to wind them up real nice, but on the whole, I’d rate it high on durability! I remember calling up customer support when I wasn’t able to figure out the manual instructions for assembling the device, and they were quite helpful. So no issues on that front! CSA-tested, wheeled, compact, portable, Durable Axial Three-Piston Pump, Start/Stop Trigger Gun with Safety Lock, 20 Feet Power Hose for wide coverage, adjustable spray nozzle. No chamber to hold cleaning solution, small spray bottle, too small cord hanger. Given its noise-free operation, wide cleaning range coverage, ease of portability and storage, the AR Blue Clean AR142-P is definitely an excellent domestic pressure washer with high power capacity and a wide range of useful features, combined together at a very reasonable price.